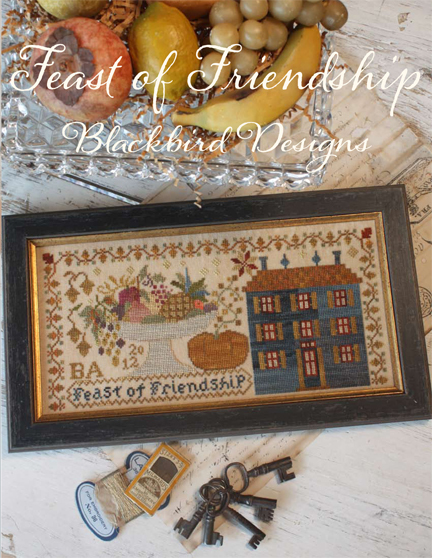 Our newest pattern, Feast of Friendship goes to the printer today. I love this piece designed by Barb. There is something about the bowl of fruit that just calls my name. I know everyone around the world doesn't celebrate Thanksgiving like we do in the states, but it's really a great holiday. It's all about everyone sitting around a table enjoying a good meal together. The laughter, stories and time spent with our kids make it really fun. Each of them has a special dish they prepare or task they do to help things go smoothly. Although I might make a couple of new dishes we haven't tried before, we pretty much stick to the same menu each year. Andy, my oldest always helps with the dishes, Jeff peels potatoes with his brother Greg. Laura makes her corn casserole. Greg also makes a wonderful sweet potato dish. Dave grills the turkey. Usually we have dear friends that show up to help celebrate too. They always bring something wonderful! This sampler symbolizes our feelings of Thanksgiving. The home represents family, the acorn border and pumpkin celebrates the harvest and the bowl of fruit symbolizes the bounty of the meal. Without delay here are our winners! back in KY i have cookie cutters that are being passed down to the 4th generation of bakers. They belonged to my Grandma, who made cookie with my Dad and Aunt, I got them when no one else wanted them - imagine that??? And now my girls have them. They are kept in an old orange little kid tool box - that was my Dad's as a child. I also have several of the receipts that my grandmother and mother used for their christmas cookies. The fabric is wonderful too, but the "Christmas Cookies" brought back old memories. I like the cookiebook (and the fabric). In our country it's not so common to bake cookies for Christmas. So maybe I can have a new Christmas tradition. 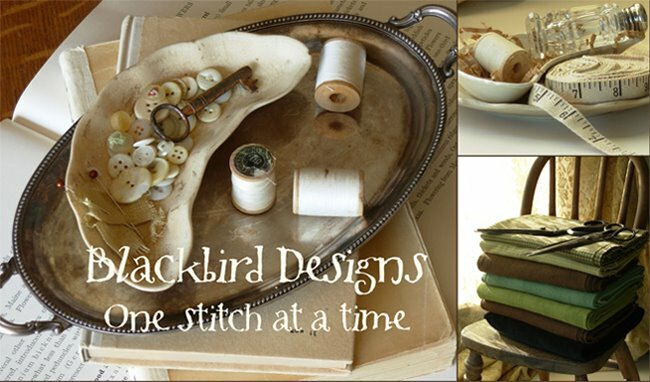 Please e-mail your address to alma@blackbird-designs.com and I will send out your package. Congrats to the winners! 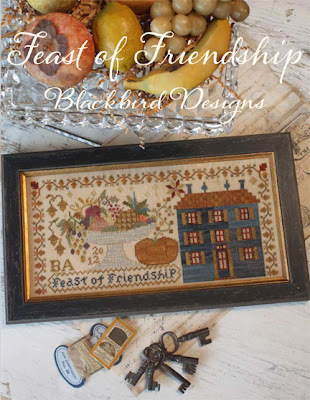 Feast of Friendship looks to be a must stitch! New pattern so beautiful!and congrats to the winners! I love the new design! Just beautiful! Congrats to the winners too. Congratulations, winners!!! Oh wow, I just love that new pattern! But I am wondering...would a beginner be able to handle such a pattern? Thanks! LOVE THIS! I hope it will be available soon! Congrats to all the lucky winners! I love your new fabric line, and also the new cross-stitch pattern. Can't wait to get both! Congrats to the winners. The new pattern is a must have! Congrats go out to the winners!! The new pattern is beautiful and wondering what kind of threads you used. They are gorgeous on that fabric. Got to find the pattern - it would fit in any time! This one will be mine when it is available. LOL. TFS. Okay, I HAVE to have this pattern. I love it!!!!!!!!!!!!!!! This is going straight onto my CHristmas wish list. Congrats to the winners, and I love, love this Thanksgiving piece! I haven't done cross stitch in 21 years, but NEED to make this one. When will this pattern be distributed? Love the new Friendship/Thanksgiving piece. Can't wait. wow,what a wonderful pattern! ♥ that house! missing your posts. hope all is well. Challenge coins city offering custom challenge coins very low cost best quality. Buying challenge coins is a complicated thing in previous days now challengecoinscity offering best challenge coins with custom option . challenge coins.